Many scholars believe that at least Matthew, Mark, and Luke were originally written in Hebrew, but not one of those manuscripts is known to exist. Also, it is possible that the books of Hebrews, Jacob, and Peter could have been written in Hebrew, since they were written to Hebrews, all of whom could read Hebrew, the language of the synagogue. There have been claims that descendants of first century Hebrew New Testament books have recently surfaced, but a copy of Matthew, purporting to be the original, that I have seen contains passages that were added in later centuries, so that cannot be a copy of a first century text. The scholars also say that the Syriac texts, a language close to Aramaic and related to Hebrew, were translated from Greek, not originally written in Syriac or translated from Hebrew. The descendants of the oldest Syriac texts were probably translated from Greek at the end of the second century or the beginning of the third century. BOKER TOV TO YALL! My name is David Mario Nocera. I have seen many comments on if MATTITYAH, YOCHANAN MORDECHAI, YOCHANAN ve LOUKAS has ever been written in IVRIT. My response to this comment is ASK OUR HEAVENLY FATHER’S HOLY SPIRIT to whom HE BROUGHT THE GOSPEL TO AND IN WHAT LANGUAGE, instead of asking so many questions about this to any child of God who has prepared himself to enter HIS MINISTRY. GOD HIMSELF WILL TELL YOU HIS ABSOLUTE, COMPLETE, ENTIRE, EXACT, IN ITS INTEGRITY AND TOTALITY IN HIS TRUTH, FOR TRUTH COMES FROM HIM AND WITH HIS TRUTH ANY HUMAN BEING WILL BE SET FREE! Thank you for writing. There is no doubt, Hebrew was the language of first century Israel. Would you comment on this. First, there is an ancient Hebrew version of Matthew. Check with Nehemiah(Yah) Gordon. Second, if the newly formed Catholic church had not destroyed or locked them up, I am confident we would know the whole truth, and have more original Hebrew versions of the “New” Testament. All in God’s time of course, but rest assured, a bunch of Torah-observant Jews under Yeshua’s direct tutelage would not have written in anything but Hebrew, which the Bible refers to as the Holy language. Greek was man’s language for the world. The entire western theological-centric teachings passed down for centuries (as you know), have only served to mislead us in too many ways. Fortunately, prophecy is being fulfilled and knowledge is increasing, including what we know of the original codices. Why would Hebrew teachings, concepts, and culture, written by entirely Jews, possibly be written in anything other than Hebrew. We need to apply more pressure on the Vatican to release what they have and open up their vaults of these ancient manuscripts. Relying upon the Greek has led to many misunderstandings and possibly contradictions or failures of prophetic fulfillment to be accurate. Consider the number of generations of Yeshua’s lineage as well as his lineage through Miriam via Joseph, her father, NOT her husband. It’s about time obedient truth-seekers started to reject the old Catholic traditions which are in defiance of Torah. Thank you for this message, which is being forwarded to the publisher. Is there an online edition where we can read a sample and look up specific NT scriptures? How did you translate Romans 8:1? Hi Bill, in Romans 8:1 many translations omit the second part of the verse like your ONM, it says ..there is no condemnation for those who are in Christ Jesus, who do not walk according to the flesh, but according to the Spirit. The second part of the verse is important, I don’t understand why translations omit it. I looked it up in the Greek and it is there. I have been hunting for a perfect Bible, I would like a copy of yours to add to my collection as I love the emphasis on our Jewish roots. Thank you for asking about that. As nice as it is, it was added in the 9th century, so it is not in the manuscripts closest to the originals. Thank you Bill! I have one more request, how did you translate John 3:36? 1. A bible must always give God the glory. 2. Since God is perfect and loving, he has to keep a perfect copy of his word. 3. God uses the least likely people, methods, etc, to get the job done. 4. Jesus said “you will know them by their fruit”, meaning that authentic Christianity will increase and people will be truly transformed by his actual word. 5. A bible must not diminish the truth, or God’s character, power, or anything else. 6. There is no “God and” or “the bible and”. Meaning, no humans or their writings, including commentaries and language studies, have anything to do with the bible or understanding it. Commentaries, et al, are opinions and languages are equal to each other. Nothing major gets lost in the translation processes. Only the Holy Spirit can give us the ability to understand the bible, and he only uses his power to do so. No writing, human, or anything else of this world can help us understand the bible in any way. Only the KJV succeeds in meeting these points. One has to listen to false teachings, commentaries, etc, in order to believe otherwise. Pretend that you were never taught anything and read the KJV alone, taking what it says as is. Ask the Holy Spirit for wisdom and understanding and be willing to obey him. Then watch your life change for the best. You will quickly find yourself becoming KJV-only, or rather truth-only. Until your last paragraph I agree with you completely. Tradition dies hard. I really like the literal translation from the Hebrew. I hope this e-mail will come back in the affirmative. Thank you for the ONM research that you have put in. May we know the great commission text is in the ONM translation? ie. Matthew 28:19,20? There seems to be a difference between the old translations and the modern ones. Thank you! Yes, Matt. 19 & 20 are in the One New Man Bible. The differences between this text and older is because other translations were by tradition even keeping many words from the Latin text, which was used for the early English translations. Also, early translations had only late Greek texts to use, that had words and verses added. Archeologists and other researchers discovered the truly ancient texts more recently (last two hundred years), so the Greek scholars were able to develop a text close to what the authors wrote in the first century – even though no first century manuscripts survive. Read the article Greek Manuscripts in the Glossary of the One New Man Bible. I was looking at getting your bible till I saw the Torah portion on your site. The name of the LORD would offend many Jewish people who will be reading this Bible. Out of respect for them the Name was changed for this Bible. I am sorry this offends you, but it will not be changed. “For am I now seeking the approval of man, or of God? Or am I trying to please man? If I were still trying to please man, I would not be a servant of Messiah” (Galatians 1:10). Why would you continue to perpetuate the lie that many Jews believe, which is not to say Elohim’s name Yah? You know there are countless verses that back up what I am saying (here are a few: Jeremiah 16:21; Exodus 20:7; Isaiah 45:5; Isaiah 42:8; Isaiah 52:6; Psalm 45:17). Lord/Adonai is a title for Elohim. It is not his name. Woe unto you, repent please! What I have done is translate. Whenever the name Yah is used, that is what I write – as in HalleluYah. This is unfortunate as His Name (YHVH) appears thousands of times and it is to be known and revered, not hidden and rendered vain, or literally to nothing. Orthodox rabbis, priests, and pastors are nothing more than Pharisees (IMHO) whom Yeshua warned us about. Bring back YHVH – Torah obedient Jews will respect this and well, if the Name of the God of Abraham, Isaac, and Jacob offends, then something is clearly wrong! I hope you will pray for guidance on this matter. Your version (with notes throughout and especially at the end) is awesome and it is my main Bible (for now), but this is definitely one of its flaws. We want to thank you for all yourlabors and dedication in the making of this glorious bible. We watch Sid Roth and saw the show that you were on and ordered the bible, What a blessing this has been. Grace and Glory be with you, we say Shalom to your life. Thank you so much for your comments. The bible is a labor of love, that I still go through daily, looking for ways to improve it. Just now I found out about the New Man Bible. (I am from the Netherlands) May the Lord Bless you for all your work He has guided you to do. Can you tell me why you have chosen to use the English and not the Hebrew personal names Isaac/Yitzchak. Originally I used the Hebrew names, but after due consideration felt that would be too confusing to most new readers. My personal preference is still for the Hebrew names. Thank you for asking. But is the name Jesus rendered as Yeshua? I really plan on buying this bible because their are so many things that are good about it, but I know their are blemishes. There is a footnote for each verse stating that Alef is the first letter in the Hebrew alphabet, Tav is the last, and that together they make a word placed in front of the direct object of a verb. There is also a reference to a Glossary article on Alef. The name of is Y’shua in this bible. 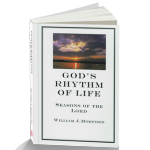 Would you have any desire to one day put the pictographic form of YHVH in your bible ? I understand you rendering the name to Lord for you must not pronounce it, it’s too holy. But, would you one day do it? I’ve had the CJB, Hebrew Roots Bible, but none has ever thought about showing the evolution of the name of God from picture form, to phonecian, to modern. There is no plan to use any form other than LORD* – but who knows what the future will bring? Would you be able to find what century this is from? And if it’s credible? The only copy of Hebrew Matthew that I have seen was translated from Greek after the 5th century because it has verses that were added in the 5th century. It appears to have been copied from a Byzantine Greek text. Was it the Hebrew Matthew Shem Tov that you have seen? Would you be able to read this document? The Hebrew Matthew that I saw was reportedly found in Spain, but I was not given a a Name other than Matthew. 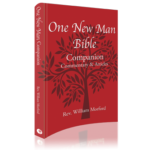 It is very easy to check for verses that were added in later centuries, so using the On New Man Bible to locate added verses, you can look in Matthew. If one is in Matthew, that book is not a copy of the first century Matthew. Oh, OK, thank you so much, that is a very good tool!!! I will surely use it! It would be cool if you’d post an article on your website about such tools so people would know of ways to tell a real thing from a counterfeit! By the way, have you considered opening up your translation to websites like http://www.biblegateway.com and http://www.bible.cc ? Opening the website to sites like biblegateway.com is the publisher’s decision. What do you think of this translation: http://aramaicnt.com/ ? Just curios as to what your opinion is. There is no Aramaic New Testament from the first century. The closest would be the Old Syiac, which might have beem translated from the Greek as early as mid second century. There are no first century texts in any language. The oldest we have are in Greek. Is it possible the verses were removed from the catholics Greek manuscripts rather than them being added to the Hebrew? The verses were added to the Greek Byzantine manuscripts, even to some other Greek manuscripts. No verses have been added to the Masoretic Text. I can agree with Scott above regarding the original gospels from the 1st century. 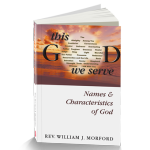 Dr Woodard book is fascinating indeed. It throws a curve ball at many liberal scholars who have really bothered to investigate this very old manuscript containing the 4 gospels signed and sealed with the authors and scribes. Interesting to that he easily explains some mysteries as to why Saul so easily goes against Yeshua’s teaching. Paul never knew of the existence of these gospel recording Yeshua’s words, but the Galatians and Corinthians did! So that is why he thought some other gospel was being preached – not his won false one but the truth. Eventually Paul came around to accepting the gospels, by the time he wrote Ephesians hopefully… I’m still reading the mighty book as well as the One New Man bible. Not having seen Dr. Woodward’s book I cannot comment on that, but I can say every time someone has shown me a supposedly older manuscript, that text has included verses that we know were added centuries later than the currently accepted Gospels. Be cautious concerning every claim and check for verses that are identified in the ONM Bile as being later additions. Could you link to the ONM Bile please, it would be nice to have a direct link. Please contact the publisher at info@tppress.com for help on linking. ONM version on Acts 9-7 And the men traveling with him had stood speechless, hearing the voice on the one hand but on the other hand not seeing anyone. they hear but not see on the first one and they see but do not here the voice. Was this error on the greek too ? that from one new moon to another; and from one Sabbath to another, (not one sunday to another) all flesh will come to worship before Me, says the LORD. 1. On Acts 9:7 and 22:9 the contradiction is in the Greek text, so we will have questions when we meet Paul and the copiers of the Greek. 2. acts 20:7 Sundown ends the Sabbath and a service called Havdalah makes the shift into the secular, working world. The footnote on that verse explains it. Bill, would you mind telling me what The ONMB’S version of philipians 2:6 is? I would like to know because the NIV, NASB, AMP, and NWT all agree that Jesus being in the form of God and one with God didn`t think equality with God was something to be eagerly grasped or retained, while the KJV & NKJV agree that Jesus being in the form of of God and one with God didn’t think it was robbery to be equal to God. You don’t have to be a PHD (post hole digger) to understand that those are two completely different verses. Help! Do you have a comment or question on either the verse or the footnote? My pastor has been preaching from The One New Man Bible for several months. The revelation especially on the understanding of take versus receive has changed our lives. We just received 32 Bibles that were purchased by members and I am preparing to order another case. My prayer has been that perhaps you would stop by our church when you are in our area of North Carolina some time. Thank you so much for writing and for the transformation through take/receive. I have sent an email so you can contact us directly. Hi, courageous man God has bless you beyond your own knowledge to be a blessing for many. Thank you for writing – you will be pleased when your ONM Bible arrives! I am throughly enjoying my study of scriptures through the One New Man Bible. Your footnotes and the Glossary are especially compelling. You have caused me to research in depth, the Sabbath, the Trinity, and the time line of Christ’s death and resurrection. The discoveries I continue to find in God’s Word are truly amazing. Have you thought of starting a “blog” for continued revelations and translational corrections, which I am sure you have?! Thank you for your comments and suggestion of a blog. That will be something the publisher and I will explore. I love the One New Man Bible. I got five Bibles last December when you were on Sid Roth’s program the 1st time. I gave away 3 of them for Christmas presents last year. I would like to know if you or someone will be putting the One New Man Bible on audio CD in the new future? Far future? 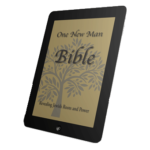 Thank you for writing and for being so enthusiastic about the One New Man Bible. The publisher has expressed a desire to make an audio CD. but has not given any date. Try asking info@tppress.com, but my guess the CD is not imminent. I have just tonight heard of the One New Man Bible through Sid Roth’s programe. My heart is leaping within me but I proceed with caution. I have been around a while and see many things and heard many things and have read many things. I am not willing to jump through any more hoops as I am not a circus poodle!! But, I respect your scholarship and know that truth is truth. I for 25 years was under certain teaching, I was taught that the NT writings are not in the order they should be to truly understand the story and know what happened and understand the true nature of the church. I do believe that it is right just as you point out in that the Hebrew scriptures come to life when read in chronological order. What order are the books of the NT part of the ONM bible in? Do you know about this need to put the writings in their proper order also? I know there are a few Bibles that have the letters in what is believed by some to be their proper order. I can recommend a book that shows where the writer believes each letter should be placed in the story from Acts and how the book of Acts seems to just drop off and either was unfinished or the rest lost. The letters written after Acts ends are put in the best possible order according to what is known. I was under legalism for so long and certainly don’t want to be hornswaggled into going back. There is an articcle in the Glossary, titled Book Order in New Testament, that describes the appropriate order for the Gospels, and then suggest the chronilogical order for the letters. The Book of Acts was cut short, but was up to date at the time it was written. I wanted to read the scripture in Malachi 4:2 to see if you had any comment on “wings” and discovered the whole chapter of 4 is left out. Can you explain why? In my Bible it ends at 3:22. All the verses there, the numbering of Chapter 3 includes what is the fourth Chapter in other bibles. The Greek word Apollyon means Destruction. I do not know where the authors of the KJV got Perdition. My wife Kim and I are reading the Blessings Amplified (Deut. 28) and was wondering how do we interpret the word “basket” in today’s world. Also, can you recommend an online source (condordance we suppose) for such questions that would better explain the the simplest to complex wordings? The basket refers to harvest, so this is saying He will provide for your needs, actually all material needs since a bountiful harvest has a surplus that can be bartered for things like salt that have to be purchased. The best lexicon for Hebrew is Brown, Driver, Briggs, Gesenius, but that would probably not answer questions like yours. A concordance will list the uses of each Hebrew word in Scripture, with the way one translation translates that word in that verse. There is no single reference book to answer every word, so a reference library is needed. Feel free to email me any time. The basket refers to something that holds the harvested produce, referring to an abundant harvest. There is no one lexicon that can answer every question. A concordance only gives the meaning from one translation, not the full meaning of the word. 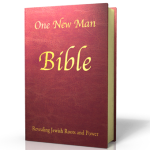 Purchased a copy of “One New Man” after seeing on Sid Roth Show. Questions I have are, (1) is the OT translation based on the Masoretic Text, and (2) is the NT based on the Textus Receptus (similar to KJV sources)? The Hebrew is the Masoretic text and the Greek is the United Bible Society 4th Edition. Thank you for your quick response. One follow-up comment/question. I’m not an expert on this subject of transcripts, but I think the UBS4 is based on the NU (Nestle) text. So what is the appropriate translation of John 3:15? KJV is — “That whosoever believeth in him should NOT PERISH, BUT have eternal life.? Bibles based on the NU text leave out the “NOT PERISH, BUT” language. Since the “One New Man Bible” is based on UBS4, I believe it also left out the “not perish, but” language. Granted since Textus Receptus, Dead Sea Scrolls and other manuscripts were discovered. But are modern bibles based on NU or UBS4 actually closer to what the early apostle writers wrote? Thank you for writing. The 4th Ed. UBS is very close to the Nestle-Aland text. The words “NOT PERISH” are not in the 4th Ed., nor are they in the Vulgate. The UBS 4th Ed. Greek is as close to what the 1st century authors wrote as present scholarship can bring us. Just as someone found the Dead Sea Scrolls, there will be more discoveries as God leads and men follow His leading. Much the same as you have clearly shown early translators were wrong or took shortcuts they thought might be “helpful,” likewise, the United Bible Society Greek scholars are mistaken. I urge you to contact Dr. Woodard directly and read his research for yourself. His discovery is as eye opening as your own. The time is NOW for God’s unveiling of His Truth again, and these revelations of accuracy are happening all over The Word!! Thank you for writing. Dr. Woodward’s website is very interesting. The United Bible Society Greek scholars list Codex W as a fifth century Greek text. They and other scholars claim that no first century manuscript has yet been discovered. With all due respect, they just believe it to be a 5th century text. According to my research (which admittedly has been some time ago now), 1-2 scholars quite some time ago determined it was from the 4-5th century and every other “scholar” has simply reiterated their conclusion. It is time more scholars truly spent the time and effort to reevaluate Dr. Woodard’s work. His findings are clearly more than coincidence (due to the number of varying examples in the codex) wherein his timing mechanism in my humble opinion is confirmed. I exchanged some discussion with Chris Putnam about it and he reached immediate conclusions based on prior conclusions re: 5th century, but wouldn’t bother to obtain one of Dr. Woodard’s books. This is exactly how theologians have inadvertently perpetuated initial bad or inadequate conclusions. As an avid bible student, including the original languages, it is SHOCKING to me how often I have personally witnessed this pattern. It is no wonder we have bad translations and a lukewarm church now. (Not blaming Chris as his other works have been excellent and I am certain it is simply a matter of time and resources or him and many others. It does not excuse it for those committed to the study of early manuscripts. Politics should never enter into the study of the Truth, but alas, it appears it has with Dr. Woodard’s fine work! Keep up the great work Dr. Morford!